16 mm film was a popular, economical gauge of film. 16 mm is the width of the film. Other common film gauges include 8 mm and 35 mm. It is generally used for non-theatrical (e.g., industrial, educational) film making or for low budget motion pictures. 16mm film also existed as a popular amateur or home movie making format for several decades, alongside 8 mm film and, later, Super 8 mm film. In 1923, Eastman Kodak released the first 16 mm "outfit" consisting of a camera, projector, tripod, screen and splicer. RCA-Victor introduced a 16 mm sound movie projector in 1932 and developed an optical sound-on-film 16 mm camera, released in 1935. 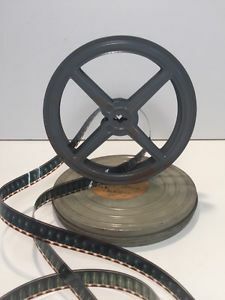 Ciné film (sometimes Cine, no acute accent) is the term commonly used in the UK to refer to the 9.5 mm, 16 mm, 8 mm and Super 8 motion picture film formats used for home movies. Cine film literally means "moving" film; deriving from the Greek "kine" for motion; it also has roots in the Anglo-French word cinematograph, meaning moving picture.